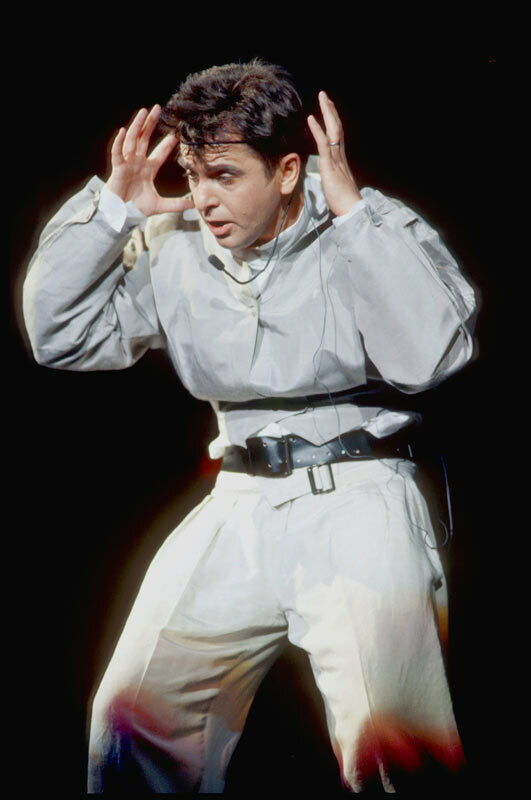 “This is the story of a small man who wants to be big…” With these words, Peter Gabriel introduced the song Big Time in Berlin in September 1987. That he himself had become one of the biggest was proven by the multi-award winning Sledgehammer video, the million-selling So album and not least the This Way Up tour that went into its second year. The shows on the This Way Up tour were not his first and only ones with the new material from So, but they took up the majority of that touring period and were arguably the most impressive ones. This is why we would like to abandon chronology and discuss these first. Name: This Way Up-Tour, USA and Canada, winter 1986. Band: David Rhodes (guitar), Manu Katché (drums), David Sancious (keyboards), Tony Levin (bass, funk fingers, stick), later Youssou N’Dour (vocals), various members of Le Super Etoile De Dakar (percussion, talking drums, vocals). 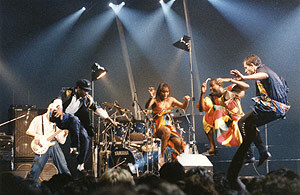 Other Acts: Youssou N’Dour & Le Super Etoile De Dakar. Set list: Floating Dogs (from tape), San Jacinto, Red Rain, Shock The Monkey, Family Snapshot, Not One Of Us (rarely), I Have The Touch (not alway), No Self Control, Mercy Street, This Is The Picture, The Family And The Fishing Net, Don’t Give Up, Big Time, Lay Your Hands On Me, Solsbury Hill (rarely), Sledgehammer, Wallflower (very rarely) or Here Comes The Flood (short version in 2 verses), In Your Eyes, Biko. Originally, I Don’t Remember, I Go Swimming, Across The River and The Rhythm Of The Heat had also been rehearsed for the tour. For some reason, Solsbury Hill and Here Comes The Flood were not among the staples for the set. Peter's clothes (if you want to match photos): White shirt and a combination of grey blazer and wide grey pants. Other Acts: see above – in Copenhagen, Oslo, Bochum and Offenbach also Little Steven, in Bochum and Offenbach (possibly other cities, too) additionally Working Week. Set list: Floating Dogs (from tape), San Jacinto, Red Rain, Shock The Monkey, Family Snapshot or Not One Of Us (very rarely, mainly in the U.S.), The Family And The Fishing Net or Intruder, Big Time, Don’t Give Up, Solsbury Hill, Lay Your Hands On Me, Sledgehammer, Here Comes The Flood / Jetzt Kommt Die Flut short 2 verse version, except 01/07/1987 where the full song was played), in Your Eyes, Biko. Peter's clothes: tight black pants with either a white shirt and black jacket or a black shirt with white jacket; occasionally also the grey combination. „Peter Gabriel has the best light show of the season“, declared Musikexpress magazine. Though he was touring mainly at the same time as his former colleagues in Genesis he still managed to grab some of their Varilites. Whereas Genesis found safety in large numbers of these spots and a flood of ever new colour combinations, Gabriel only used sparse and accentuated lighting. The stage was usually tinged in white or blue. There was little use of colour showers, light curtains, light fan effects, red lights (Red Rain) or blinding spots on the stage floor. The main role in this light spectacle was played by something else: Surprised audiences saw what looked like four stage braces begin to move in sync or independently, circling, sinking, like a ballet of swan necks. At the top of these ultramobile lighting cranes were, in the bar of the T, as it were, three Varilites each. Even when they did not move there was a little green light moving along the crane. A technical description like this does not convey how the cranes appeared to the audiences: they felt organic, threatening, like archaic dinosaurs, like the claws of a praying mantis, like a four-headed hydra lurking above the stage. When the 12 Varilites were lined up and moved in a row it seemed like a landing U.F.O. Peter had dropped the heavy make-up since his previous tour in 1983, using only a little kohl to emphasize his eyes, but he kept and even developed many achievements from the previous tour: the stage setup with rising hexagons, theatricality, gestures, choreography (David Sancious called it “dancing by intuition”), drama, the stage dive into the audience. 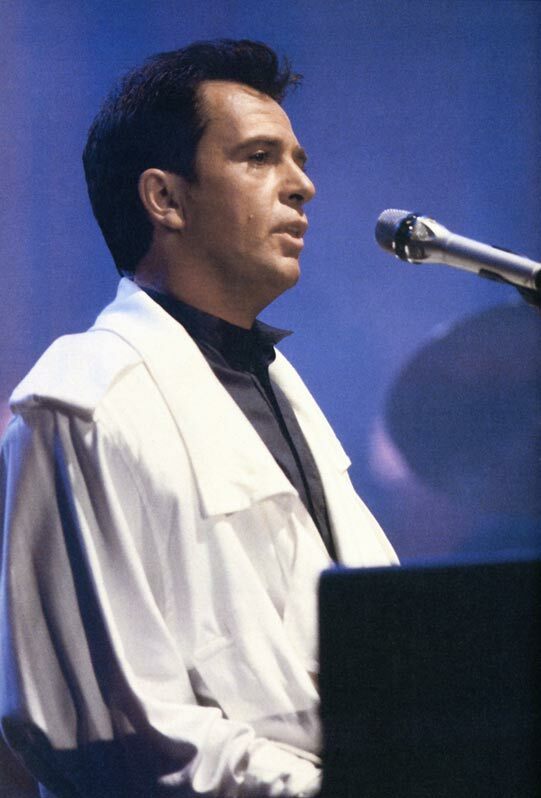 Nothing new for old Gabriel fans, but stunning for all those who were new to Peter’s concerts. Whereas Peter’s earlier audiences consisted mainly of “guys in jeans and intellectuals” (David Rhodes), it now had become much younger and there were far more women in the crowd. The standards had risen. You will forgive us when we focus on the things that were new, for some of the older material, e.g. the remarkably agile choreography for Shock The Monkey, was presented basically as in 1983. This Is The Picture was used for a dancing contest during which the band were introduced. Everyone grabbed an instrument they could hang around their necks and stood in a line next to each other. In a kind of minimal choreography they moved in sync in the same directions. This included a routine in which they would move their heads to the left, then, after a brief pause, to the right and immediately back to the left. Peter’s special guest in New York Laurie Anderson found this quite a challenge so that she frequently found herself eye to eye with Peter to everybody’s amusement. The ending of Don’t Give Up, which is so unobtrusive on the album, became a very positive, optimistic affair to clap and sing along. In Your Eyes became a real party song. Peter and Youssou, both clad in colourful and black vests, danced and played with each other to the sound of the talking drums like exuberant children, built a human see-saw, developed a shaking-hands jump and learnt many dancing steps from the Super Etoile De Dakar. Special honours to Marietou Kote who whirled across the stage with her feet never a second in the same place or the same position! 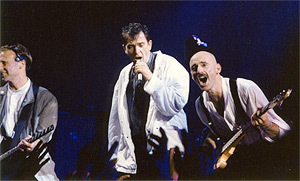 Long-time band members Jerry Marotta and Larry Fast were not part of the live band anymore in 1986/7. Both had played very little on So because Peter’s new style had moved away from the dark and mysterious. His new, more commercial up-tempo songs that drew on funk, soul and groove demanded new, more colourful musicians, Peter decided. 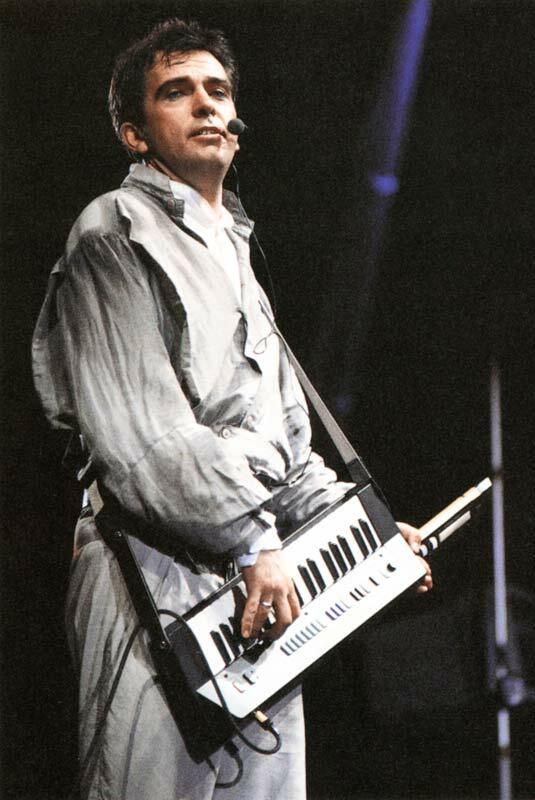 Gabriel had also learned a lot about the synthesizer so that he began to grow independent of Larry Fast. Both musicians were not quite happy with Peter’s decision to sack them – they felt he was taking a wrong turn with the change in style. At the fourth show at Earls Court, London, Peter Gabriel was joined for Don’t Give Up by a pregnant Kate Bush. The support was sorely needed, because a Don’t Give Up that was sung by Gabriel alone lost much of the special magic of the song. The So tour was the first one that Peter had officially filmed. The last two shows in the picturesque Lykabettus amphitheatre in Athens, Greece, were free, because the show was continually stopped for the cameras and many songs and shots had to be repeated several times. Work continued all night until the next morning. The product of these efforts was called P.O.V. It came out three years later on video (never officially on DVD yet) and is not a concert film but a collage of numerous sources. Still it is a great document of the tour highlights. Name: Conspiracy Of Hope-Tour, America, summer 1986. Band: David Rhodes (guitar), Manu Katché (drums), Ian Stanley (keyboards), Larry Klein (bass). Other acts: U2, Sting, The Police, Lou Reed, Bryan Adams, The Neville Brothers and, in various cities, Bob Dylan, Tom Petty, Jackson Browne, Joan Baez, Joni Mitchell, Little Steven and Miles Davis. Set list: Red Rain, Shock The Monkey, San Jacinto, Sledgehammer, Family Snapshot, Biko. Clothes: Peter in a fashionable short-sleeved blue shirt. U2’s Bono had asked Peter to take part in series of shows to celebrate the 25th anniversary of Amnesty International, and Peter had to cancel So promotion that had been scheduled for Spain, Portugal and Japan. The charity concerts were less of a Gabriel show than a joint event for Amnesty. A total of 150,000 people saw the show, Amnesty managed to free two political prisoners as a result of the concerts, grossed $2.6 million and won 40,000 new members – it was a big success. With a hastily assembled band and few light effects (Peter played the open air concerts in full daylight!) it was Peter’s choreography and gestures that made the concerts so impressive. He held the microphone clutched in both hands for most of the time – an intense gesture that resembled prayer. He did not shy away from a few candid words to the Americans. Red Rain, for example, was dedicated to all death row inmates in the country, and San Jacinto was introduced as a song about “human rights in this country”. The new songs from So in the set were well-received. Red Rain was played a bit slower than on the album and benefitted from more echo in Peter’s voice. The echo intensified the threatening mood of the song when it reverberated from the stadium walls. Sledgehammer began with a very strange introduction, with only the rhythm giving away the song. But it became obvious when the (real) brass group came in. The combination of brass, organ and backing vocalists got everybody going. Peter premiered the new choreography for the song, with goose-step, dirty hip movements, flying arms and frog hops. 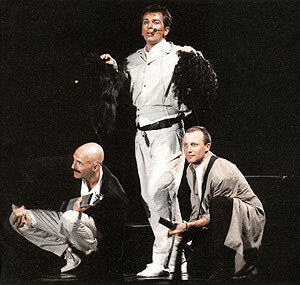 David Rhodes, then still with a short blonde ponytail, was always happy to help Peter out in uptempo songs, which led to some unusual pas-de-deuxs. “New boy” Manu Katché (with short hair) provided the necessary structure with some powerful drumming. The Conspiracy Of Hope tour was eleven days long, yet full of intense experiences. In San Francisco Peter met Nelson Mandela’s former fellow prison inmate, Sonny Venkatrathnam, who told him about torture and captivity. When the audience carried on the vocals in Biko Sonny had tears in his eyes: “I did not know that there are people over here who care” – a moving moment. When the tour came to Denver, the only place where ticket sales were flagging, Bryan Adams assembled Joan Baez, Bono and Peter; they went straight to the most popular radio station in the city, straight into their studio where flabbergasted radio presenters immediately changed their programme and made what was basically an hour-long commercial for the Amnesty show. In the hour after that 2,000 additional tickets were sold. Name: Artists Against Apartheid-Konzert, June 1986. Name: International Day Of Peace-Konzert, vor dem UN-Building in New York, September 1986. Band: Omar Hakim (drums), Daryl Jones (bass), Little Steven (guitar), David Sancious (keyboards), Shankar (violin), David Biehl (electronic percussion), Youssou N'Dour (vocals) und Alain Agbatha (vocals). The show for the University For Peace organization took place on a simple stage without a roof in glaring sunshine. When Little Steven had turned up for the rehearsals in a dark hall with sunglasses the day before, Peter had joked: “I have learned something on the Amnesty tour: All those singers and musicians, and I was the only one without dark glasses!” He followed the trend for the concert, because he, too, wore sunglasses. The live premiere of In Your Eyes made the concert special. It had almost nothing to do with the album version, but rather with the Special Mix that backed the Don’t Give Up single. On its way to the stage this song changed to a happy upbeat thing with talking drums, piano and Youssou’s incredible voice – danceable and very infectious! Further impressions: 1) The sampled baritone part for In Your Eyes went off at all possible and impossible times, even during Red Rain. 2) Peter as the ‘travelling salesman’: “Outside the venue you can buy T-shirts … and we make a hell of a profit. (laughter) No, actually the money goes to UNICEF and the network for a drug-free New York so it helps children everywhere…” 3) Sun City: Peter looked deep into Little Steven’s eyes and very seriously sang: “People round the world, baby, it can’t be denied” (with broad grins everywhere). Set list: 20/12: Here Comes The Flood, Red Rain, Shock The Monkey, San Jacinto, Sledgehammer, Biko, In Your Eyes. 21/12: Red Rain, Shock The Monkey, No Self-Control, Sledgehammer, In Your Eyes, Biko.
? ?/12: (All Star Band:) Revolution. Clothes: Peter in the grey combination, Tony Levin and David Rhodes with the black wigs. The two wintry open air shows (shudder) for the University For Peace organisation borrowed their name from the Greek goddess of peace, Eirene. Peter's performances at both shows were very similar to those of the This Way Up tour, though there were no light cranes. 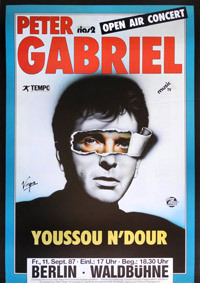 In Your Eyes was a highlight with strong support by the complete Super Etoile De Dakar; another highpoint was Sledgehammer which was introduced with a very simple piano intro. Name: The Secret Policeman's Third Ball, London, March 1987. Band: Papa Omar N'Gom (guitar, vocals), Habib Faye (bass, vocals), Youssou N'Dour (vocals), Jackson Browne (vocals, Biko), Lou Reed (vocals, guitar), Rick Bell (saxophone, Tell It To Your Heart & Voices Of Freedom). 29.03.: (Lou Reed:) Tell It To Your Heart (PG piano), (Lou Reed:) Voices Of Freedom (PG vocals), (Youssou N'Dour:) My Daughter (PG vocals), Biko; (All Star Band:) I Shall Be Released. Clothes: Peter all in black. Playing again for Amnesty International, Peter Gabriel put more emphasis on his piano playing than usual. He even began Biko on the piano. There was much fun with the Senegalese musicians in the backing choir for Voices Of Freedom. Wallflower suffered from technical problems, which was why he switched to the safer Biko for the second night. Interestingly enough, the drums for Biko came from a tape (or the synclavier?). New book about the career of Peter Gabriel.